Rate measurement for quartz watches, tuning fork and mechanical watches. Adjustment and accelerated test of watch ICs with EEPROM. Measurement of IC- and total current consumption by integration. Pulse generator with adjustable supply voltage and pulse width. Test of watch batteries and test signal for buzzers. Watch power supply with variable voltage. Connectors for external signal sensors and watch carrier. 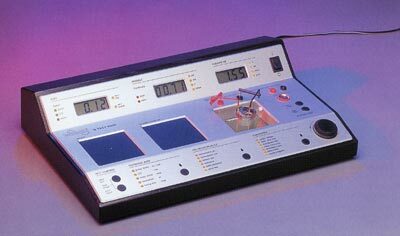 Measurement of the resistance, test for short circuits and interruptions. Interface RS232 for the connection of a printer.